The lists below include resources for teachers and students. 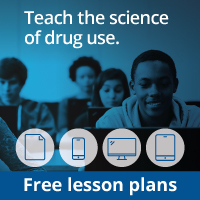 This Web site contains information about drug abuse as well as a section designed specifically for parents, teachers, and students. Drug Pubs is NIDA’s research dissemination center. Visitors can order hard copies of NIDA publications or download electronic versions in multiple formats. NCADI provides information and materials on substance abuse. Many free publications are available here. Nicholls, J.G., Wallace, B.G., Fuchs, P.A., & Martin, A.R. From Neuron to Brain. Sunderland, MA, Sinauer Associates, 2001. Developed for readers with an interest in the human nervous system with little or no background in the biological sciences; describes how nerve cells transmit signals and messages. Woolsey, T.A., Hanaway, J., & Gado, M.H., The Brain Atlas: A Visual Guide to the Human Central Nervous System. Hoboken, New Jersey, John Wiley & Sons: Fitzgerald Science, 2003. This book is a comprehensive and accurate atlas of the brain. It includes nearly 400 images of the brain and its pathways. Lists the history of neuroscience from 4000 B.C. to the present. Friedman, D. Focus on Drugs and the Brain. Frederick, MD: Twenty-First Century Books, 1990. Part of the "Drug-Alert Book" series; gives a good overview of the brain, neurotransmission, effects of drugs on the brain, and addiction. Contains information on the brain and neurotransmission, activities, experiments, pictures, and other resources for students and educators. NIDA. "Brain Power: Grades 2-3." National Institute on Drug Abuse, 1 Sep. 2012, https://www.drugabuse.gov/publications/brain-power/brain-power-grades-2-3. NIDA. Brain Power: Grades 2-3. National Institute on Drug Abuse website. https://www.drugabuse.gov/publications/brain-power/brain-power-grades-2-3. September 1, 2012.